As CIOs and CTOs shift their focus to digital transformation projects and the launch of new digital business offerings, demand for traditional IT services has evolved. Worldwide revenues for IT Services and Business Services totaled $506 billion in the first half of 2018 (1H18) -- that's an increase of 4 percent year over year, according to the latest market study by International Data Corporation (IDC). During 1H18, it was a mixed picture for tier-one global outsourcers and systems integrators headquartered in developed countries. Most remained flat or declined slightly. But this was partially offset by stronger performances by two large global vendors, who returned to double-digit growth. Indian IT services firms still outpace the U.S. and European counterparts, but their growth slowed from a year ago, continuing their 2H17 deceleration. While most large Indian vendors continued to grow at rates in the low single digits to high teens, it was offset by a few vendors' sharp slowdowns. Project-oriented revenues grew by 5.2 percent in 1H18 to $191 billion, followed by 3.6 percent growth for managed services and 2.7 percent for support services. The above-the-market growth in project-oriented markets was mostly led by business consulting and application development markets with growth rates of 7.5 percent and 6.5 percent, respectively. In outsourcing, revenues grew 3.6 percent to $238 million in 1H18. Application-related managed services revenues (hosted and on-premise application management) outpaced infrastructure and business process outsourcing. On the infrastructure side, while hosting infrastructure services revenue accelerated to 7.2 percent growth in 1H18, mostly due to cloud adoption, IT Outsourcing (ITO) – still almost twice as large a market and mostly big buyers and vendors – declined by 1.5 percent, largely chipped away by cloud cannibalization across all regions. On a geographic basis, the United States grew by 4.3 percent, slightly higher than the market rate, while Western Europe grew only by 2.6 percent. IDC expects Western European services revenues to be stable but structurally weaker than North America. IDC forecasts the region to grow below 3 percent annually in the coming years. In emerging markets, Latin America, Asia-Pacific (excluding Japan) (APeJ), and Central & Eastern Europe led in growth. In Latin America, most major economies are turning the corner despite problems in Argentina and Venezuela. In APeJ, Australia saw its growth scaled back slightly to 3.8 percent in 1H18, from 4.3 percent in 1H17. The largest market, China, trimmed its growth rate to just 7.2 percent, down from the 8 percent to 9 percent during the last two or three years. So far in 2018, the weaker growth in China and Australia was partially offset by faster growth from other emerging markets in APeJ. IDC expects this trend to continue. Governments will fund large digital transformation initiatives and a better investment outlook will also drive IT spending. 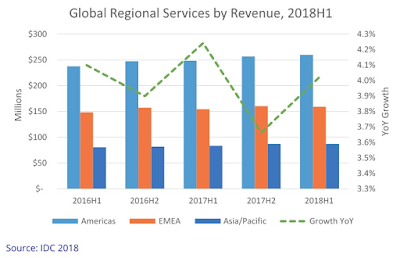 "Steady growth in the IT services market is being driven by continued demand for digital solutions across the regions," said Lisa Nagamine, research manager at IDC. 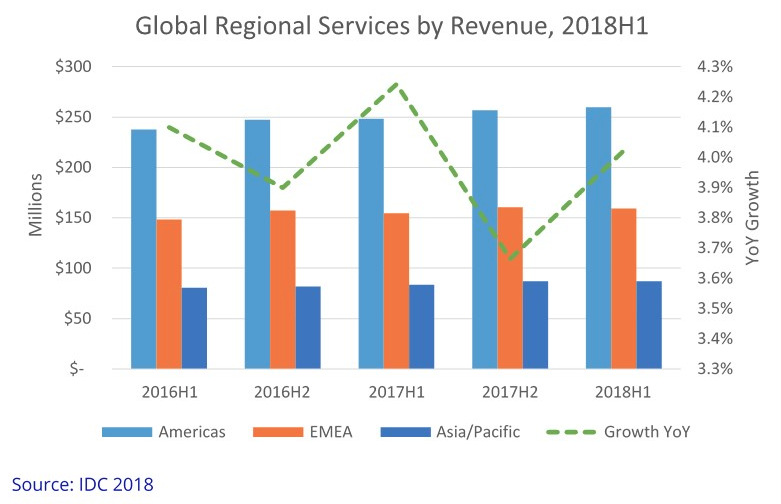 "But during 2018, as well as most of 2017, it is really the Americas and cloud-related services that are having the largest impact on revenue worldwide."